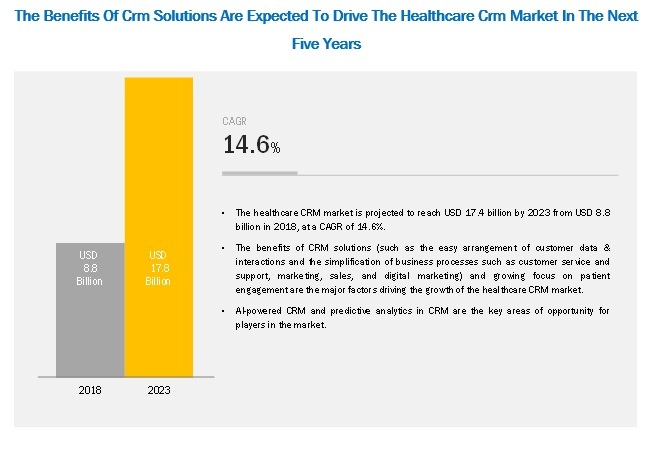 [121 Pages Report] The global healthcare customer relationship management (CRM) market is estimated to reach USD 17.4 billion by 2023 from USD 8.8 billion in 2018, at a CAGR of 14.6% during the forecast period. The study involved four major activities to estimate the current size of the healthcare CRM market. Exhaustive secondary research was done to collect information on the market, peer market, and parent market. The next step was to validate these findings, assumptions, and sizing with industry experts across the value chain through primary research. Both top-down and bottom-up approaches were employed to estimate the complete market size. Thereafter, market breakdown and data triangulation strategies were used to estimate the size of the segments and subsegments in the market. Secondary research was mainly used to obtain key information about the industry’s supply chain, the market’s monetary chain, the total pool of key players, market classification and segmentation according to industry trends to the bottom-most level, geographical markets, and key developments from both market- and technology-oriented perspectives. In the secondary research process, various secondary sources were referred to in order to identify and collect information for this study. Secondary sources include annual reports, press releases, and investor presentations of companies, white papers, journals, certified publications, articles from recognized authors, gold-standard and silver-standard websites, disease-specific organizations, directories, and databases. Primary research was conducted to identify segmentation types; industry trends; key players; and key market dynamics such as drivers, restraints, opportunities, challenges, industry trends, and strategies adopted by key players. In the primary research process, various sources from both the supply and demand sides were interviewed to obtain qualitative and quantitative information for this report. Primary sources are mainly industry experts from the core and related industries and preferred suppliers, manufacturers, distributors, technology developers, researchers, and organizations related to all the segments of this industry’s value chain. In-depth interviews were conducted with various primary respondents, including key industry participants, subject-matter experts (SMEs), C-level executives of key market players, and industry consultants, among other experts, to obtain and verify the critical qualitative and quantitative information as well as assess the future growth prospects. The revenue generated by leading players has been determined through primary and secondary research processes. After arriving at the overall market size from the market size estimation process explained above, the total market was split into several segments and subsegments. To complete the overall market engineering process and arrive at the exact statistics for all segments and subsegments, data triangulation and market breakdown procedures were employed, wherever applicable. The data was triangulated by studying various factors and trends from both the demand and supply sides. Micromarkets1 are defined as the further segments and subsegments of the global healthcare CRM market included in the report. The RoW includes Pacific countries, the Middle East, Africa, and Latin America. Core competencies3 of companies are captured in terms of the key developments, SWOT analyses, and key strategies adopted to sustain their positions in the market. The healthcare CRM market is estimated to reach USD 17.4 billion by 2023 from USD 8.8 billion in 2018, at a CAGR of 14.6% during the forecast period. Market growth can largely be attributed to the benefits of CRM solutions, such as the easy arrangement of customer data & interactions and the simplification of business processes such as customer service and support, marketing, sales, and digital marketing. On the other hand, concerns regarding patient data security and the high cost and complexity of the CRM implementation process may limit market growth to a certain extent during the forecast period. On the basis of deployment model, the healthcare CRM market is segmented into on-premise model and web/cloud-based model. In 2018, the web/cloud-based model segment is expected to account for a larger market share. This segment is also estimated to register a higher CAGR during the forecast period. Advantages such as low maintenance cost, robust security features, and improved accessibility and recoverability of data are driving the growth of the web/cloud-based model segment. On the basis of functionality, the healthcare CRM market is segmented into customer service and support, marketing, sales, digital marketing, and other functionalities. In 2018, the customer service and support segment is expected to account for the largest market share. The growing focus on patient engagement, rising pressure on healthcare organizations to reduce costs, and the importance of ensuring customer satisfaction are major factors responsible for the large share of this segment. The other functionalities segment is expected to register the highest CAGR during the forecast period. Based on region, the healthcare CRM market is segmented into North America, Europe, Asia, and the Rest of the World (RoW). North America, segmented into the US and Canada, is estimated to hold the largest share of this market in 2018. However, the Asian market is expected to register the highest growth in the market during the forecast period. Market growth is mainly due to rising patient awareness, improvement of healthcare systems, growing medical tourism in Asian countries, and favorable government initiatives, among other factors. Salesforce (US) was the leading player in the healthcare CRM market, with a share of 22% in 2017. More than 100,000 companies have chosen Salesforce as their CRM solutions provider to streamline their business. The company has a strong cloud footprint with its SaaS offerings. Salesforce’s strength lies in its ability to deliver innovation and engage its customers effectively. The company sells its products via direct and indirect sales distribution channels. Salesforce’s growth strategy lies in cross-selling and upselling, extending existing services, expanding partner ecosystems, expanding its business into different regions, and entering into new markets. SAP SE (Germany) was the second-largest player in the healthcare CRM market, with a share of 10% in 2017. Its robust product portfolio aids SAP in sustaining its leading position in the market. It helps to create valuable interaction with customers by offering solutions for commerce, revenue, sales, and services. SAP utilizes technologies, such as internet of things, artificial intelligence, and machine learning, to bring in innovation in various fields. The company has incorporated disrupting technologies like AI and machine learning to its cloud-based solution called SAP CRM. To incorporate these disruptive technologies into its software solutions, the company relaunched SAP Leonardo, its integration platform. In order to capitalize on the growth opportunities in the healthcare CRM market, the company emphasizes on adopting organic as well as inorganic growth strategies. In 2018, Salesforce launched Salesforce Integration Cloud. In 2018, IBM partnered with Salesforce. This partnership aimed to bring together Cloud and Watson services from IBM with Salesforce Quip and Salesforce Service cloud Einstein to allow organizations to connect with their customers more effectively. In 2018, SAP acquired Caliduscloud (US) to strengthen its cloud-based customer relationship management solution. Where will all these developments take the industry in the mid to long run?